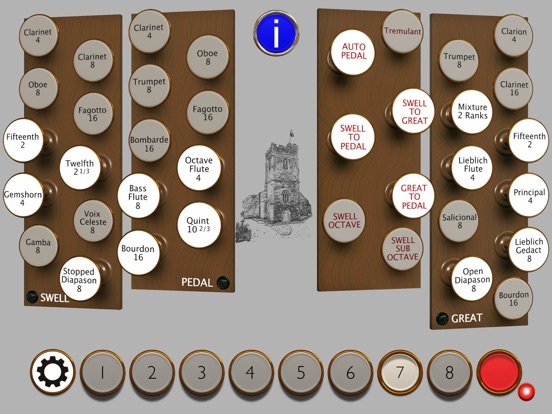 This is a faithful, ultra high quality reproduction of the organ in St. Just in Roseland church, Cornwall, and is fully playable using a single MIDI controller keyboard. All features of the real organ are reproduced. The organ may be played with one or 2 manuals, and supports a 32-note pedalboard. 22 stops, a rich selection of couplers and a tremulant on the Swell division are in place in this digital recreation. Additionally 8 programmable pistons are provided to allow one-touch access to frequently-used registrations. A high quality reverberation engine is provided in the app, and the reverb controls, overall instrument volume, swell, crescendo and the pistons may all be controlled by an attached MIDI controller. By exploiting Wavetable Trajectory Synthesis rather than sample replay, this app is tiny, yet manages to capture all the beauty and the subtle nuances of the organ. 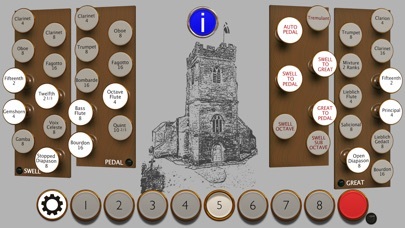 Note that this app does not contain a playable on-screen keyboard, so either attached USB MIDI controllers, or another app capable of generating virtual MIDI are required to play the organ. Privacy Statement : this app does not access any of the personal data on your device. For this release, after user feedback we have subtlely rebalanced the voices. AudioBus / IAA has been fixed. Experimental support for LaunchPad stop control is in place. ‘Foot Controller’ CC 4 added to list of available controller numbers for Swell and Crescendo. The Piston Program button is now doubled up as a MIDI panic button - touch it, and any hung notes will be cancelled.